Composer John Debney has long been one of Hollywood's most versatile, not to mention prolific, and his first foray into the ever-growing, world of video games is the upcoming LAIR. In an earlier post you'll find some video of a live performance of score excerpts. Suffice it to say that fans of Shore, Williams, Elfman, and (dare I invoke the names of) North and Rozsa, will find moments a familiarity, but with great appreciation for the whole. The clip below is over 16 minutes long. UPDATE: 8/5/2007 - Having received a 5 track promo of the LAIR soundtrack, there's little doubt that this might be the must-have soundtrack of the year - game soundtrack or otherwise. 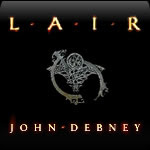 The score for LAIR is as big or as bold as one could want, so hears hoping negotiations with interested labels will happen quickly and an epic release of the Debney's score is forthcoming.